Back in 2016, I did a post expounding on one of my favorite films noir, 1945’s SCARLET STREET . 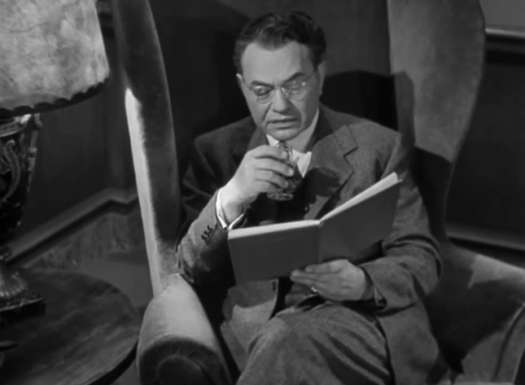 This dark masterpiece of corruption starred the titanic trio of Edward G. Robinson, Joan Bennett, and Dan Duryea in a sordid tale directed by German legend Fritz Lang, with moody cinematography courtesy of Milton Krasner. 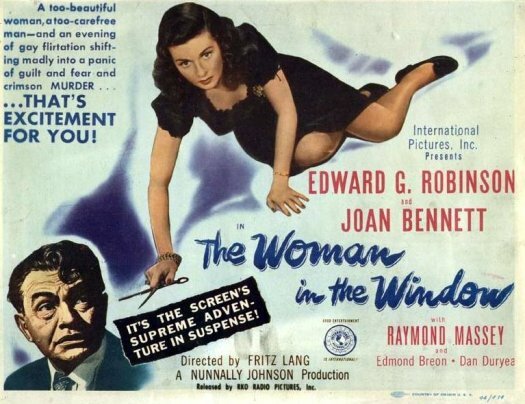 Recently, I viewed a film this team made the year previous, THE WOMAN IN THE WINDOW, with a screenplay by producer Nunnally Johnson. 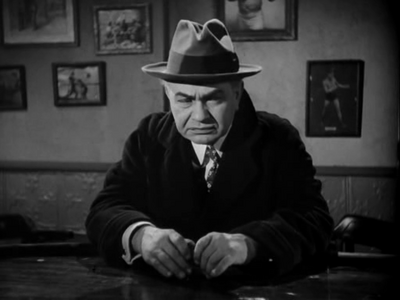 Comparisons were inevitable, but though there are certainly similarities between the two films, this one stands on its own as a powerful entry in the film noir canon. With all that talent, would you expect anything less? I’m using this October’s horrorthon as an excuse to take rewatch and review all of Dario Argento’s films! Today, we take a look at one of Argento’s best known and most popular films, 1977’s Suspiria! I’m going to start things out by admitting that this is an intimidating review to write. I once had a discussion with fellow TSL contributor Leonard Wilson about why it’s always so much easier to write about films that we hate than it is to write about films that we love. That’s certainly something that I’m thinking about right now, as I try to think of where to begin with Suspiria. It’s not just that I like Suspiria. Anyone who has ever visited this site before knows how much I appreciate Italian horror in general and Argento in specific. No, it’s that I absolutely love this film. I was sixteen the first time that I saw it and I’ve loved it ever since. To me, Suspiria is not just one of the best horror films ever made. It is truly one of the best films period. And I know that I’m not alone in feeling like that. Suspiria is a classic in every sense of the word. Compared to almost every other film that Argento has made, the plot of Suspiria is remarkably straight forward. Suzy Banyon, an American ballet student, enrolls at the prestigious Tanz Dance Academy in Frieburg, Germany. From the minute she arrives, she gets the feeling that there is something strange happening behind the garish walls of the school and she’s right. While the film may be best known for Argento’s directorial flourishes and Goblin’s classic score, the story itself unfolds with the simplicity of a fairy tale. The film even opens with a narrator who informs us, “Suzy Banyon decided to perfect her ballet studies in the most famous school of dance in Europe. She chose the celebrated academy of Freiburg. One day, at nine in the morning, she left Kennedy airport, New York, and arrived in Germany at 10:40 p.m. local time.” It’s the film’s equivalent of starting things off with, “Once upon a time…” Having let us know that we’re about to watch a fairy tale and therefore having served his purpose, the narrator isn’t heard for the rest of the film. As played by Jessica Harper, Suzy Banyon is yet another neurotic but brave Argento protagonist who has found herself in a strange land. One of the things that I love about Suspiria is that Suzy is such an ordinary and relatable character. She’s not “the chosen one.” She’s not a witch or an aspiring witch or the daughter of a witch or the reincarnation of a witch. She’s not desperately looking for a husband or dealing with a family tragedy or any of that other BS that we have to deal with in today’s cinema.. She doesn’t have any dark secrets or untapped magical powers. She’s not seeking vengeance. She has no trendy agenda. She’s not the protagonist of the latest YA novel. Instead, she’s a dancer. She is someone who is attempting to pursue something that she is good at and that she loves. In short, she is the viewer. Suzy Banyon is us and we are Suzy Banyon. Like us, she’s sometimes scared. Like us, she’s sometimes brave. And, like us, it’s just not in her nature to leave a mystery unsolved. However, for Suzy, her initial concern is that everyone at the school appears to be trying to cheat her out of her money. Madame Blanc (Joan Bennett) has arranged for Suzy to stay in an apartment on which she’ll have to pay rent. When Miss Tanner (Alida Valli, a force of pure nature in this film) finds out that Suzy’s bags have yet to arrive and Suzy doesn’t have any ballet shoes, she tells her to borrow a pair from another student. The student immediately offers to sell them to Suzy and is visibly deflated when Suzy says that she’s just needs to borrow them for a day. And, of course, there’s Olga (Barbara Magnolfi), a student who thinks that names that start with S are the names of snakes. But it’s not just money that Suzy has to worry about. There are also maggots that fall from the ceiling, the result of a shipment of spoiled meat. There’s the strange and labored breathing that Suzy occasionally hears behind the walls. There’s the fact that her new roommate, Sarah (Stefania Casini), is convinced that the teachers are hiding a secret. Sarah’s therapist, Dr. Frank Mandel (Udo Kier, playing an oddly respectable role) thinks that Sarah is suffering from delusions but is she? And, of course, there’s all the mysterious deaths. For instance, Daniel, a blind piano player, has his throat ripped by his seeing eye dog. Interestingly enough, Daniel is played by Flavio Bucci who, in The Night Train Murders, played a murderer. One of his Night Train victims was played by Irene Miracle, who would later have an important role in Suspiria‘s semi-sequel, Inferno. And through it all, you have Goblin playing on the soundtrack. The film’s score is so important and so relentless that, in its way, it becomes just as important a character as Suzy, Sarah, Madame Blanc, Miss Tanner, or even Udo Kier! The score is relentless and, depending on how loudly you play the film, almost deafening. I saw an interview with Goblin’s Claudio Simonetti where he said that he wanted the score to be “almost annoying” in its relentlessness. The score overpowers you, in much the same way that the witches of Suspiria overpower their victims. Suspiria was co-written by Daria Nicolodi, Dario Argento’s girlfriend and the mother of Asia Argento. Nicolodi has long claimed that Suspiria is based on something that happened to her grandmother. Argento, meanwhile, has said that nothing in the film was based on fact. Reportedly, Nicolodi wanted to play the role of Suzy and was so offended with Argento instead offered her the role of Sarah that she went off and made Mario Bava’s Shock instead. Personally, I think that Nicolodi would have been wasted in the role of Sarah but, at the same time, it’s hard to imagine anyone other than Jessica Harper as Suzy Banyon. For that matter, it’s also impossible to imagine anyone other than Dario Argento directing Suspiria. Suspiria is Argento’s masterpiece, taking all of his frequent and familiar motifs (bloody murders, artistic protagonists, the constantly roaming camera, the use of primary colors) and pushing them to their natural extreme. It’s hard to imagine anyone other than Argento telling Suspiria’s story. And yet, that is exactly what is about to happen. For years, of course, I’ve heard rumors of a remake and, perhaps naively, I’ve dismissed them. I took some comfort in the fact that even Dario Argento himself came out and forcefully denounced the idea of anyone remaking his masterpiece. Remake Suspiria? I would think to myself, Surely no one is that stupid. Whatever, Luca. Suspiria doesn’t need you and it doesn’t need to be remade. Suspiria is perfect just the way it is. Based on the beloved classic by Louisa May Alcott, the 1933 film Little Women tells the story of the March sisters. Growing up in Concord, Massachusetts during the Civil War, they wait — with their mother, Marmee (Spring Byington) — for their father to return from serving as a chaplain in the Union Army. There are four sisters. The oldest, Meg (Frances Dee) is a responsible and practical (which is a nice way of saying that someone is boring) seamstress. The youngest, Beth (Joan Bennett) is beautiful but selfish. Meanwhile, saintly Beth (Jean Parker) spends her time playing a severely out-of-tune piano. And then there’s Jo (Katharine Hepburn). Jo is just a year younger than Meg and … well, basically, she’s Katharine Hepburn. She’s an independent-minded intellectual who dreams of being a writer and who isn’t interested in conforming to society’s expectations. She’s head-strong and occasionally, she’s too stubborn for her own good. But she’s also kind-hearted and loves her sisters, even if she does sometimes disagree with them. We follow Jo as she rejects one potential suitor, poor earnest Laurie (Douglass Montgomery) and discovers another when she meets the older Prof. Behar (Paul Lukas). We also watch as a family tragedy brings her and her sisters back together. In fact, Katharine Hepburn is so perfect as Jo that it throws the rest of this adaptation out of balance. So totally does Hepburn dominate this film that it’s hard not to feel that the other March sisters end up getting a short shrift. To a certain extent, it does make sense. Jo is the lead character and the story is largely told through her point of view. But, for someone who enjoyed reading Alcott’s novel, it’s hard not to be disappointed. I mean, Jo is great but some of us may have related more to one of the other March sisters. Like Beth, for instance. Another problem with this version of Little Women is that the March sisters are all supposed to be teenagers and yet, they’re played by actresses who were in their 20s. For instance, 23 year-old Joan Bennett played Amy, who is supposed to be only 12 years old when we first see her. By casting actresses who were already clearly adults, it makes t difficult for the film to work as a coming-of-age story. With all that said, it bears repeating that Katharine Hepburn is absolutely perfect as Jo and, if you’re a Hepburn fan (and who isn’t), this is one of her essential films. It helps that she was directed by George Cukor, the director who was responsible for some of Hepburn’s best performances. The rest of the movie doesn’t quite live up to Hepburn’s performance but she was such a great talent that it almost doesn’t matter. Little Women was nominated for best picture. However, it lost to Cavalcade. After I watched King Solomon’s Mines, I watched yet another 1950 best picture nominee, Father of the Bride. In Father of the Bride, Spencer Tracy plays a lawyer named Stanley Banks. As you might expect of any character played by Spencer Tracy, Stanley Banks is a no-nonsense type of guy. He’s set in his ways and not particularly enthusiastic about the idea of change. Stanley has worked hard to get a good job and a nice house in the suburbs. He loves his wife, Ellie (Joan Bennett) and is a firm but good father to his two boys, Tommy (Russ Tamblyn) and Ben (Tom Irish). If Stanley does have a soft spot, it’s for his daughter, Kay (17 year-old Elizabeth Taylor). Stanley admits that he’s always given Kay everything that she’s ever wanted and that she is his favorite of all his children. However, Kay has been acting strangely as of late. She just seems to be so happy! Stanley can tell that she’s in love, though he has no idea with whom. (He is, however, happy that it’s probably not the bespectacled political radical who Kay apparently dated at some point in the past.) Finally, during an otherwise typical family dinner, Kay announces that not only is she in love but she’s also engaged to be married! His name is Buckley (Don Taylor, who would later direct Escape From The Planet of the Apes and Damien: Omen II) and, at first, Kay refuses to even introduce him to her parents. Eventually, however, Stanley does meet Buckley and he’s happy to discover that not only does Buckley come from a wealthy family but he also owns a small business of his own. However, just because Buckley is the perfect 1950 man, that doesn’t mean that the wedding is going to be easy. As a befuddled Stanley watches, the wedding grows more and more elaborate (not to mention, expensive!). All of the expected complications ensue: Buckley and Kay have a fight, a wedding planner makes things difficult, and Stanley does not immediately get along with Buckley’s parents. But, for the most part, Father of the Bride is about Stanley struggling to accept that his daughter has grown up and is ready to start a life of her own. Fortunately, this is also a Spencer Tracy film and whatever gravitas that the film may have comes from Tracy’s honest and straight forward performance. Tracy never begs for laughs but he gets them anyway, because of the honesty that he brings to the character. Perhaps his best moment comes after Buckley and Kay have had a fight. After comforting his daughter, Stanley discovers that Buckley is at the front door. At first, the protective Stanley tells Buckley that Kay doesn’t want to see him. Suddenly, Kay comes running down stairs and embraces Buckley. Between sobs and kisses, Buckley and Kay dramatically swear to each other that they will never fight again. The camera pans over to Stanley, standing a little to the side and listening. At first, Stanley seems befuddled by how overdramatic the two of them are acting over a relatively minor fight but there’s also just a hint of sadness in Stanley’s eyes as he realizes that his daughter truly has moved on. Father of the Bride was nominated for best picture but it lost to the far more subversive All About Eve. 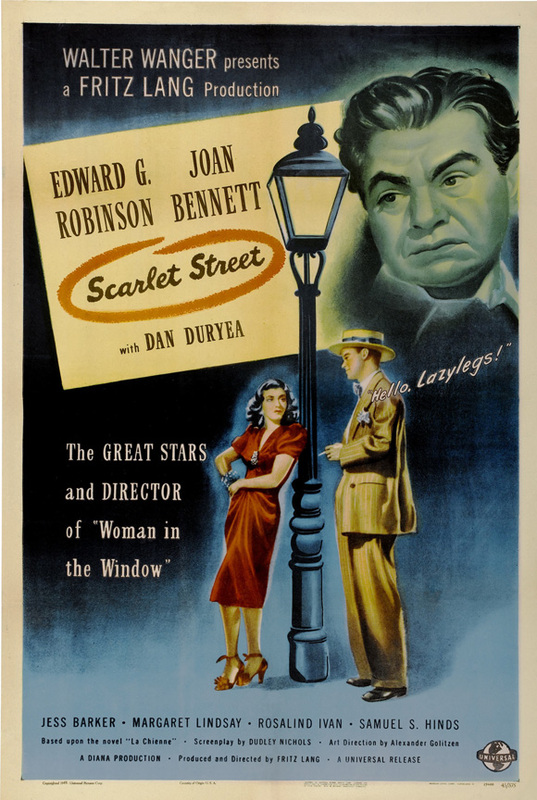 One of my favorite movies of any genre has always been SCARLET STREET. I used to watch the grainy Public Domain print on my local cable access channel over and over. When I saw that TCM was running the film last October, I recorded it for future reference, as I was in the midst of my “Halloween Havoc” marathon. I finally got the chance recently to sit down and enjoy this beautiful, crispy clear print and watch the film as it was meant to be seen. One reason that I love February is because it’s during this month that TCM broadcasts 31 Days of Oscar. Over the course of this month, TCM is devoting itself to showing Oscar-nominated films. While this means that they are showing a lot of my favorite films, it also means that they’re showing some obscure films that I might otherwise never have had a chance to see. Disraeli is one of those previously obscure films. 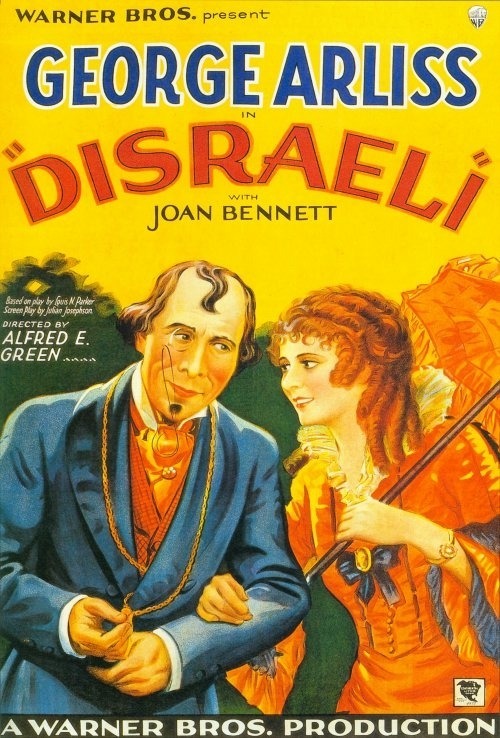 Released in 1929, Disraeli was an early sound film that starred a distinguished stage actor named George Arliss. Recreating a role that he had previously played on stage and in a silent film, Arliss was the first British actor to ever win the Academy Award for Best Actor. Disraeli itself picked up a nomination for best picture but lost to All Quiet On The Western Front. Disraeli tells the story of British Prime Minister Benjamin Disraeli (played, in a likable if overly theatrical performance, by Arliss). Disraeli was the first (and, to date, only) person of Jewish descent to serve as prime minister. A favorite of Queen Victoria, Disraeli held the office of prime minister several times during the late 19th century and remains one of the most influential leaders in British history. Reflecting the fact that it was initially made at a time when its title character was still a well-known historical figure, Disraeli spends next to no time explaining how Benjamin Disraeli reached the office of prime minister or why he believed the things that he believed. Indeed, the film tells us remarkably little about just what exactly Disraeli, as leader, did believe in. Instead, it takes for granted that the audience will know who Benjamin Disraeli was and why he was important. The film, focuses on one aspect of Disraeli’s career — his efforts to purchase the Suez Canal and allow Victoria to add “Empress of India” to her list of titles. Along the way, he finds the time to encourage a tepid romance between his aide (Anthony Bushnell) and the young Lady Clarissa (played by Joan Bennett, who — nearly 50 years later — would play the sinister Madam Blanc in Dario Argento”s Suspiria). While this approach may have worked for audiences in 1929, modern viewers will probably wonder just what exactly everyone’s going on about. If you didn’t know that Disraeli was based on a stage play, you would be able to guess it from watching the movie. It’s not just that this is an extremely talky film. It’s also a very stagey film, a reminder that the initial introduction of sound resulted in American cinema taking a step back artistically. Whereas silent films were free to experiment both visually and narratively, a film like Disraeli had to be shot in order to accommodate the limitations of the early sound era. As a result, the camera rarely moves and scenes are made up of static shots of groups of people standing close together and delivering lengthy passages of exposition. While this may not have been an issue for audiences who were still amazed by the very existence of talking pictures, modern audiences will probably find the film to be pretty dull. Disraeli is a difficult film to recommend for a modern audience but it is interesting to watch from a historical point of view. As I watched Disraeli, I was reminded of a current Oscar contender. Much like Lincoln, Disraeli attempts to humanize a famous politician and is structured around the lead performance of an acclaimed British thespian. Much like Disraeli, Lincoln is a fictionalized account of how a powerful and controversial leader manipulated a reluctant government into making history. That Lincoln deals with the struggle to end American slavery while Disraeli celebrates British imperialism says a lot about the difference between 1929 and 2013.